The king has appointed Prime Minister ‘Akilisi Pōhiva as Minister of Foreign Affairs and Lord Ma’afu as Minister of His Majesty’s Armed Forces, with effect from Friday 19 January, 2018. The confirmation came after the Prime Minister had an audience with His Majesty King Tupou VI on Wednesday. The Prime Minister “recommended” himself to the king to be appointed as Minister of Foreign Affairs and Lord Ma’afu to become Minister of His Majesty’s Armed Forces. The meeting was called after what appeared to be a clash between the power of the Prime Minister to nominate “all his cabinet ministers” and the power of the king as Commander-in-Chief of the forces on land and sea to appoint “all officers” at His Majesty’s Armed Forces, emerged. As Kaniva News reported earlier this week, Pōhiva met with the King on Wednesday afternoon. “The Prime Minister had an audience with His Majesty, King Tupou VI, on 17th January, 2018,” the Prime Minister’s office said Saturday in a statement. “Subsequently, His Majesty approved the recommendations from the Prime Minister to appoint the Prime Minister, the Hon. Samuela ‘Akilisi Pōhiva as Minister of Foreign Affairs and Lord Ma’afu Tukui’aulahi as Minister of His Majesty’s Armed Forces, with effect from 19th January, 2018,” the statement said. The lineup list submitted to His Majesty on 3 January showed the Prime Minister was proposed to become the Minister of His Majesty’s Armed Forces and also the Minister of Foreign Affairs. The king appointed Pōhiva’s ministerial lineup on 2 January, but he wanted further discussion with the Prime Minister before making any appointments for His Majesty’s Armed Forces and the Ministry of Foreign Affairs. A government spokesperson said Pōhiva was “happy” after their meeting with the king. The Tongan constitution says the King is the Commander-in-Chief of the forces on land and sea. It says His Majesty shall appoint all officers and make such regulations for the training and control of the forces as he may think best for the welfare of the country but it shall not be lawful for the King to make war without the consent of the Legislative Assembly. “The Hon. Prime Minister, Samuela ‘Akilisi Pōhiva and the Hon. Cabinet Ministers will serve their second term in office from 2018-2021,” the Prime Minister’s office said. 1. Semisi Kioa Lafu Sika, People’s Representative of Tongatapu 2 is appointed as Deputy Prime Minister and Minister for Infrastructure and Tourism. 2. Lord Ma’afu Tukui’aulahi, Noble’s Representative, is appointed as Minister for Lands and Natural Resources. 3. Dr. Pohiva Tu’i’onetoa, People’s Representative of Tongatapu 10 is appointed as Minister for Finance and National Planning. 4. Dr. Saia Ma’u Piukala, People’s Representative of Tongatapu 14, is appointed as Minister for Health and Minister for Public Enterprises. 5. Penisimani ‘Epenisa Fifita, People’s Representative of Tongatapu 9, is appointed as Minister for Education and Training. 6. Semisi Tauelangi Fakahau, People’s Representative of Tongatapu 8, is appointed as Minister for Agriculture, Food, Forests and Fisheries. 7. Sione Vuna Fa’otusia, People’s Representative of Tongatapu 7, is appointed as Minister for Justice and Minister for Prisons. 8. Mateni Tapueluelu, People’s Representative of Tongatapu 4, is appointed as Minister for Revenue and Customs and Minister for Police and Fire Services. 9. 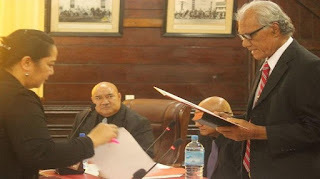 Poasi Mataele Tei, People’s Representative of Tongatapu 6, is appointed as Minister for Meteorology, Energy, Information, Disaster Management, Environment, Communications and Climate Change. 10. ‘Akosita Havili Lavulavu, People’s Representative of Tongatapu 16, is appointed as Minister for Internal Affairs. 11. Dr. Tevita Tu’i Uata of Vaini is appointed as Minister of Commerce, Consumer, Trade, Innovation and Labour.